NEW Mahogany Brown Undertone! 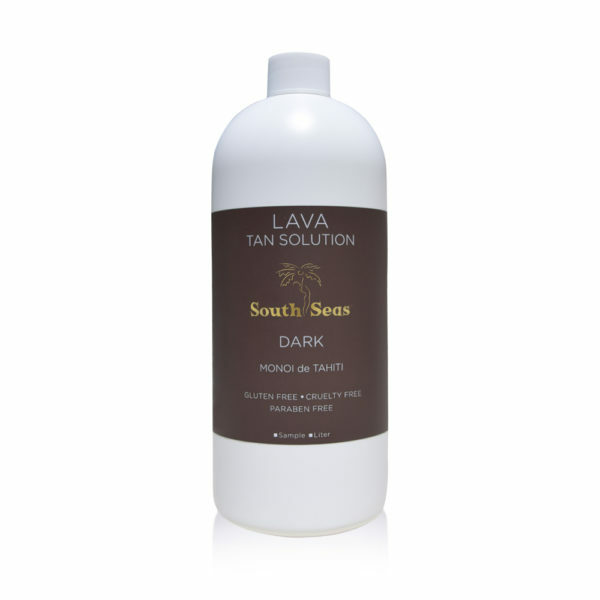 South Seas Lava Tan Solution is the most sought after spray tanning solution in the world. Inspired by the volcanic originations of French Polynesia, Lava erupts with mahogany undertones emanating a dark, rich and radiant glow. Hydrating coconut water native to the islands’ brings your hottest color to the surface. Fast drying, non-sticky, cucumber-melon scent, paraben-free. Our solutions are made fresh and we encourage you to buy a three month supply at a time. 4 Liters will yield 90-100 tans; one liter will yield 20-25 tans; one 8oz will yield 4-6 tans. All South Seas Tanning Solutions are pH-Balanced and do not require barrier cream. Sizes: 8oz, 1 Liter, 4 Liter Pack. Recommended for: All skin types, this is the best-selling South Seas solution. 11.5% DHA, cucumber-melon scent. Directions: Apply 1-2oz (50mL) approximately 4”-5” away from the skin with any HVLP or airbrush equipment. Wait 8 hours before showering/full development.